New Ireland Governor, Sir Julius Chan has expressed confidence in the performance of Newcrest in his province, by announcing a new era of constructive relations between Newcrest and the people of New Ireland. “I want Newcrest Lihir to continue to operate and make a lot of money so that this can filter down to the community and benefit the whole of our Province”, a statement he made when he officiated at the Lihir Secondary School 2015 graduation ceremony, held on Lihir last week. The ceremony also coincided with the opening of the school’s 76-bed boys’ dormitory built under the PNG Government’s Tax Credit Scheme (TCS) and valued at K14.67m.. In his address to around 2000 people including students, school officials, parents, senior government officials, church and business representatives, Sir Julius called on the leaders of Lihir, LMALA (Lihir Mining Area Landowner Association), the Nimamar Local Level Government and others to take heed and turn the course towards working in greater partnership. “I do not want any more stop work notices” he stated. “The Tax Credit Scheme has touched every secondary school in the whole of New Ireland Province. We are working on Namatanai Secondary School to upgrade it and Lihirians should therefore be proud of the benefits that are flowing into the Province,” said Sir Julius. Extending his thanks to Newcrest Lihir GM Craig Jetson, Sir Julius said, “I hope you remain with us for the next 30 years so we can continue this partnership and bring more development to our people on Lihir and New Ireland through the TCS”. 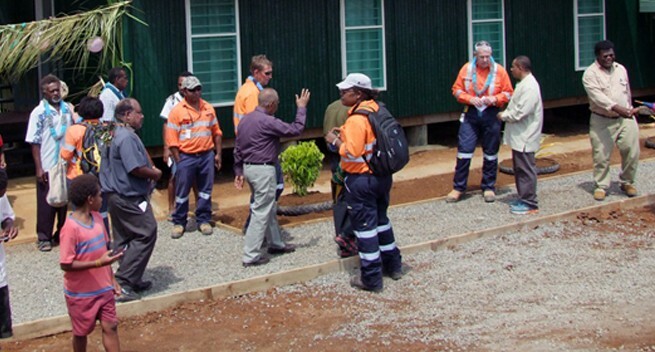 Meanwhile, Mining Minister, Byron Chan also echoed the Governor’s sentiments adding the success of the Tax Credit Scheme is a credit to all involved, i.e Newcrest, New Ireland Provincial Government and Nimamar Local Level Government.